You must be a member of the Boston Movie Nights Group to attend this activity. Would you like to join this group? The paintings created by Picasso in this film cannot be seen anywhere else. They were destroyed upon completion of the film. The French government has declared this film a national treasure. Directed by Henri-Georges Clouzot (France, Protected content , 78 min.). Digital. Like a matador confronting a bull, the artist approaches his easel, his eyes blazing. As he wields his brush, we see through the canvas as the artwork unfolds, erupts, dances into being before our eyes. 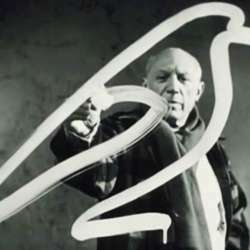 Pablo Picasso, one of the most influential artists of the 20th century, is making a painting, and Henri-Georges Clouzot, the famous French director (The Wages of Fear and Les Diaboliques), is making a movie. In Protected content , Clouzot joined forces with his friend Picasso to make an entirely new kind of art film, “a film that could capture the moment and the mystery of creativity.” Together, they devised an innovative technique in which the filmmaker placed his camera behind a semi-transparent surface as the artist drew on it with special inks that bled through the plane. Clouzot thus captured a perfect reverse image of Picasso’s brushstrokes, and the motion picture screen itself became the artist’s canvas. In this film, the master creates, and sometimes obliterates, 20 works, most of them destroyed after the shoot. The works range from playful black-and-white sketches to Cinemascope color murals that materialize in minutes through the magic of stop-motion animation. Unavailable for more than a decade, The Mystery of Picasso is exhilarating, mesmerizing, enchanting, and unforgettable. It is simply one of the greatest documentaries on art ever made.